Chinese hamster ovary (CHO) cells are predominant in the production of therapeutic proteins to treat various diseases. Characterization and investigation of CHO cell metabolism in a quick and simple way could boost process and cell line development. 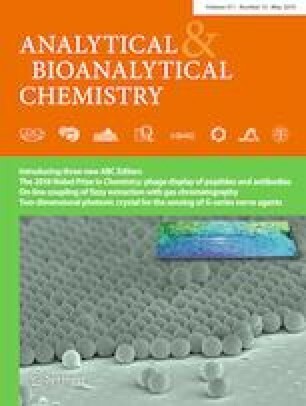 Therefore, a method to simultaneously detect seven redox- and energy-related metabolites in CHO cells by capillary electrophoresis has been developed. An on-line focusing technique was applied to improve the peak shape and resolution by using a 50 μm × 44 cm uncoated fused silica capillary. Key parameters and their interactions were investigated by design of experiments (DoE) and optimized conditions were determined by desirability function as follows: 24 °C, 95 mM, and pH 9.4 of BGE. The method was validated to ensure sensitivity, linearity, and reproducibility. The limits of detection (LODs) ranged from 0.050 to 0.688 mg/L for seven metabolites, and correlation coefficients of linearity were all greater than 0.996. The relative standard deviations (RSD) of migration time and peak area were smaller than 0.872% and 5.5%, respectively, except for NADPH, and the recoveries were between 97.5 and 101.2%. 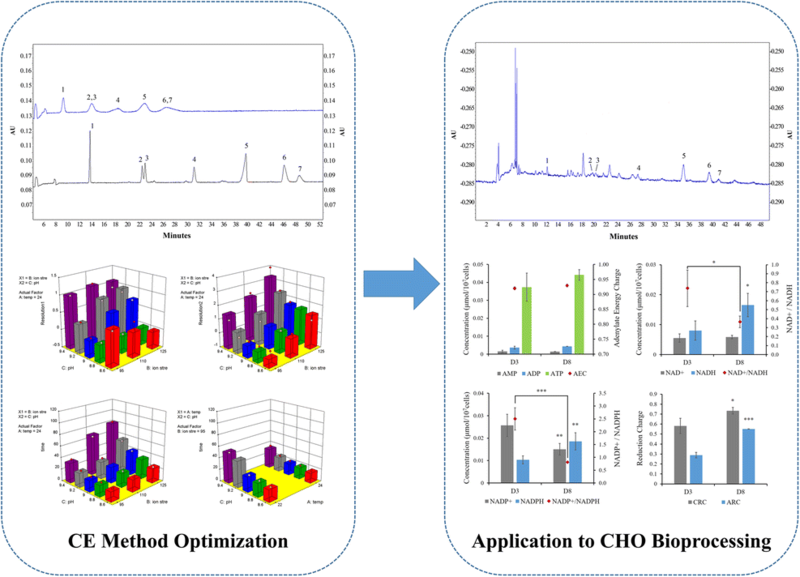 The method was successfully applied to analyze the extracts from CHO cells under two different culture conditions. Jiaqi Wang and Chen Wang contributed equally to this work. The online version of this article ( https://doi.org/10.1007/s00216-019-01747-9) contains supplementary material, which is available to authorized users.